This was a four piece set. 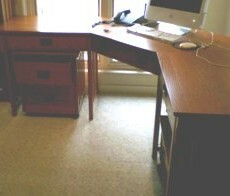 The desk was sectional with a book case, filing cabinet and printer stand with drawer. 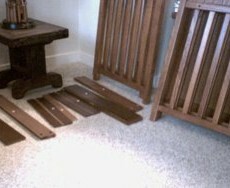 The first piece of furniture takes longer than the rest as the handyman figures out the manufacturer’s scheme. You should also consider disposal of the packaging materials. There are usually quite a lot of packaging to deal with, and time spent for breakdown and disposal. Usually this is the responsibility of the assembler. Hello I would say 150$ to 200$ is about right depending on the size and complexity of what they want, but a lot of businesses want more then one thing set up like a whole office full of stuff so I charge 50 – 150$ more for each piece. Assuming the customer has the materials on site, I charge by the hour. $75 first hour and $30 additional hours. I estimate this at 3 hours totaling $135. Removing the boxes etc is $30 for dump charge. $75.00 base charge: arrival to site, drive-time, fuel, service vehicle. Then you need to factor if the product is KD. KD means knock down and requires complete assembly or is pre-assembled, only requiring minor attachment to each other. $250 to $350 including cleanup (dusting, vacuum) and disposal depending upon complexity and any necessary repairs (prior to assembly – yes it happens) and obtaining missing hardware (fasteners – yes it happens). Many of you guys are charging far too little. Please think about the time it takes! Detailed and documented (notes and photos) inventory of parts and fasteners is essential. 1 to 2 hrs minimum including review of manufacturers instructions which are often erroneous. You need to catch the errors BEFORE you start. Use logic and experience to evaluate. And remember, even organizing, packing, and hauling waste is usually 2 hr minimum “project” plus dump fees and fuel. Sometimes disposal of styrofoam and the “plastic wrap” is problematic = expensive. I agree with Danny – he is most sensible. Well done Bro. Don’t forget about your travel, fuel, and equipment amortization… factor 15 to 20 percent for tools & equipment. It recently cost me $200 to redo my batteries and charger in my cordless tools (drill, circ saw, recip saw, etc). We need to sprinkle that overhead across customers as we serve them. Dining: 1 table, 4 chairs. Nothing special i.e. normal. Never quote a fee including disposal. Always give customer option to DIY. If the customer asks you to do it then gently explain there is a true cost. Stand by it. You need to feed your family. And pay taxes LOL. Bedroom: Queen platform with large elaborate headboard and underbed drawers on both sides and end… with fucked up instructions, damaged side rail, and missing fasteners. 😀 Made in Malaysia. No offense. Stuff happens. If it is a first-time customer unlikely to repeat then they will pay the service call fee. Explain to them the fuel and tool costs and tell them the next time they call they will receive a $75 service call discount. Loyal repeat customer invoices show $75 service call DISCOUNT for loyalty right on the invoice. Put it in up top, then pull it out before final total. Do you even have customers with those prices??? The idea of a handyman is to fix something that is broken, you are suppose reasonable. you start charging customers those ridiculous prices that end up being higher than what the item is worth! To install 4 cubicles. Fully loaded with cables. 8×10. I have been installing furniture for 15yrs and I know everything about Building. I’ve been told I low ball it to much. Let me know what you think. Price should change on delivery and other factors. I ran into this nightmare recently. We had 2 big dressers, a medium dresser, simple 5ft shelf with 4levels, 2 lamps. It took 21/2 hours, including disposal, for one of the big dressers for 1 person. I dont know where the dressers were purchased bit it started with an I. Lol. Its roughly 2000 a year for insurance and liscense alone to legally be a handyman. That i place charges around 50% of product cost to assemble or 80 for 200. Not including tool cost, gas, etc. Its hard to load the tolls in my truck to leave the driveway for less than 35 an hour. Work pushes that to 50 min. Youll be lucky to make 40 g a year working 40 hr weeks with those numbers. That is just jobsite work, not bidding, taxes, time purchasing/fixing tools. Now please explain how 50 an hour is cheap? What would the cost be to disassemble a wooden computer L shaped deesk, move across the room to the other side, reassemble and put together computer, phone and printer? About 4 hr job. Phone, Printer, PC is all inclusive. All of that is just plug and play. I always throw those in at no extra fee. Makes no logical sense imho.